A weekend spent in the classroom proved to be a success! Everyone showed up on Saturday morning with excitement in their hearts but still a little sleep in their eyes. This was quickly remedied with a quick tour of the Navajo Chieftain before class started. With the energy levels raised we moved to the classroom and delved into the ins and outs of our new aircraft, for many of us, our first multi-engine experience. We tackled the aircraft systems, limitations, flight controls and operations. Leaving the classroom with new knowledge and countless numbers to remember in order to tame this beast. We wave and say our goodbyes knowing we are all going home not to rest, but to continue our studies while the information is still fresh and the excitement is still alive. I walk into the class the next day and before saying hello, my classmate says “What’s the operating range of your EGT? (Exhaust Gas Temperature)” Without hesitation I recite the answers to the three different ranges used in phases of flight and include the extra note of when and how to lean the mixture on climb. He looked at his notes to confirm and nodded. With added confidence that I knew yesterdays material, we started class. Sunday focused on fuel, electrical and environmental systems as well as flight instruments and anti-icing procedures. With all the required material covered, we took a short break before completing a group walk-around of the aircraft. This simulated the procedure we would have to go through prior to fly the plane in the coming weeks. With the class material covered, and the plane thoroughly inspected and admired, only one thing was left. The test. We came back into the classroom with the test papers on our respective desks. There was no more chit chat as a soft hush fell over the classroom. 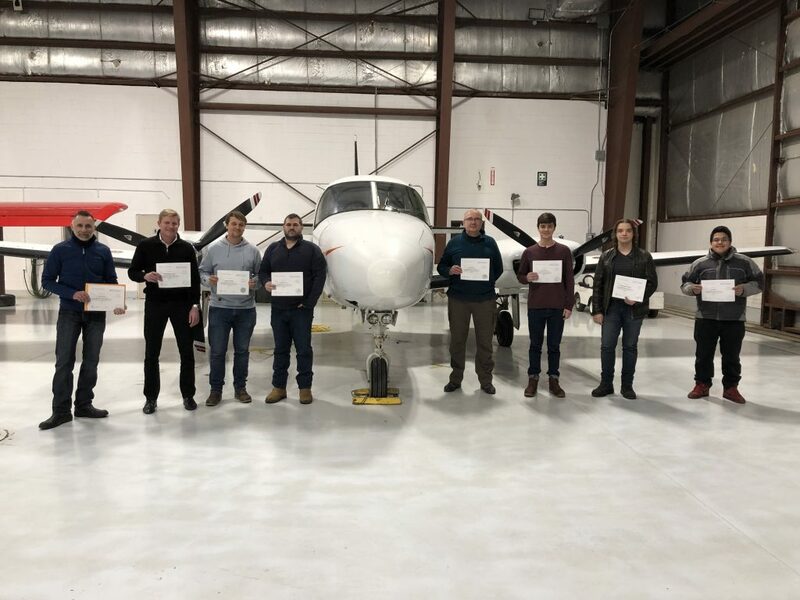 Passing this test would decide whether we would finally get to take the next step in our aviation careers, our multi-engine rating. With a total of 30 questions and a passing mark of 70% there wasn’t much room for error. I worked my way through the exam, putting stars next to the harder ones, the ones where they try to trick and confuse you. I got to question 30 and looked back… 9 of them had stars. I went back over each question meticulously trying to get into the head of the examiner. I marked my answers and hoped for the best. With every question having an answer, I handed in my exam for review. The examiner took it into the next room to mark it privately. Once he had marked everyone’s he walked back out. As he slowly handed them out, I watched everyone’s expression light up. He then approached my desk and handed me my exam… 90%, 27/30. With relief in my heart we were handed our certificates and posed proudly for the picture.